Nikolas Georgalis was born July 23, 1957 in Union City. The son of an immigrant couple from the Greek island of Rhodes, he was a quick and coordinated athlete who began boxing at an early age but later switched to basketball at the request of his mother. Nick, who went by “Galis” in school, attended Union Hill High School, where he developed into a multitalented six-footer with a feathery scoring touch. Nick played for Bill Raftery at Seton Hall as a small forward. He created significant matchup problems for opponents, as witnessed by his 27.5 scoring average as a senior—third in the nation in 1978–79 behind Lawrence Butler and Larry Bird. He was named the NY-Metro Player of the Year in 1979. Nick was selected in the NBA Draft by the Boston Celtics, but an injury in camp led to his release. Red Auerbach later said that the biggest mistake of his career was cutting Nick Galis. Nick took his game overseas and became an instant star—and hero—in the Greek national league. When he arrived, basketball was an afterthought. By the time he retired, the sport was one of the nation’s most popular. Ironically, the owners of the Aris club were hesitant about signing him because of his height. He netted 30 points in his first game and went on to average 30 points every year he played for the team—including 44.0 in 1980–81 and 41.2 in 1983–84. Between 1983 and 1991, Aris won 8 league titles and had 3 undefeated seasons. The team went to the European Champions Cup Final Four each year from 1988 to 1990. Nick had a game that was well-suited for Europe. His mid-range jumper was quick and accurate, meaning he could not be left open at any time. He had an array of post-up moves he could employ against shorter players and was a magnificent penetrator, which gave taller, slower opponents fits. Nick led the Greek League in scoring 11 times and was the Euroleague top scorer 8 times. 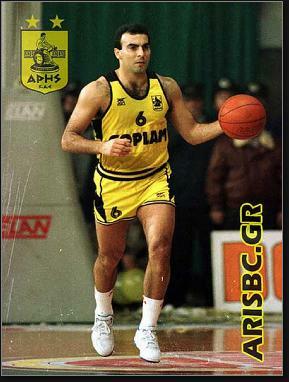 He was Greek basketball’s MVP 5 years in a row. Competing in an era with players like Vlade Divac, Drazen Petrovic, Arvydas Sabonis, Toni Kukoc and Sarunas Marciulionis, he was Europe’s Player of the Year in 1987. At the age of 35, Nick’s skills began to erode and he moved to Panathanaikos in 1992–93. Ironically, its logo had a green shamrock similar to that of the Cektics. He played three more years as a pro and although his scoring dropped into the teens and 20s, he led the league in assists in 1993 and 1994. In a 1993 game against his old club, Nick shot a perfect 13-for-13 from the field and added 19 assists. Nick’s career scoring average in league play was 33.5. In international competition, Nick averaged 30.6 points in 169 games. At the 1986 World Championships of Basketball, he had games of 53, 49 and 46 points. He also scored 45 points in an 81–80 win over the Soviet Union during EuroBasket 1989. After his retirement, Nick opened a successful basketball camp. He was a torchbearer during the opening ceremonies at the 2004 Olympics and was among the inaugural inductees in the FIBA Hall of Fame in 2007. Nick and Bill Russell were the only Americans in that first group. In 2017 he was enshrined in the Basketball Hall of Fame in Springfield.